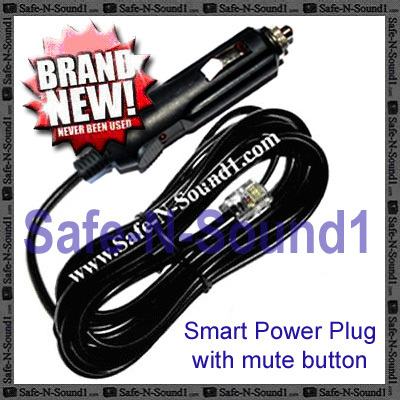 Valentine V1 Cigarette Lighter Smart Power Plug Straight Cord - "Be Safe with Safe-N-Sound1.com"
What is a Cigarette Lighter Smart Power Plug with Built-in mute button? The Cigarette Lighter Smart Power Plug is an optional accessory that allows you to connect your radar detector directly to your cigarette lighter outlet and has a built in mute button for easy use. The Cigarette Lighter Smart Power Plug straight cord is approximately 8 feet long and comes with a built-in FUSE to protect your radar detector and a mute button for easy use. The mute button will mute the threat alerts and can change the modes on all models.